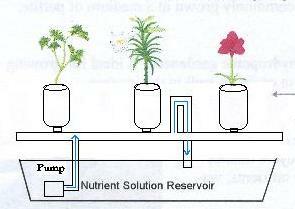 The Ebb and Flow (also know as flood and drain) method of hydroponic gardening simply allows all the plants in the garden to be fed the same amount of nutrient solution at the same time. The plant grow bed, which contains plant pots filled with a growing medium, is flooded with the nutrient solution for a set period of time and then allowed to drain for a set period of time. This allows the growing medium and plant roots to stay moist while bringing fresh oxygen to the root base each time the nutrient solution drains away. An Ebb and Flow system, popular with many home hydroponic gardeners, is ideal for growing a broad variety of crops since both long and short term crops do well in this system. Listed below are some Ebb and Flow Growing systems. Brand New Ebb & Flow Hydroponic Garden 39" x 39" x 6.5"
Flo-n-Gro Ebb & Flow System - 12 Site * *!